The original CareerMatrix system was created by Beth Janney of American Careers with the goal to bring together employers and job seekers. The buzz word back then was e-commerce business, and many local business were excited to become part of the new emerging technology of CareerMatrix.com. 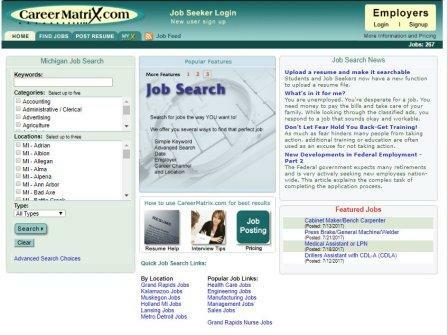 CareerMatrix was also a welcome resource for jobs seekers, because we introduced a simple way to store resumes and submit applications to employers. At the time, applications submitted needed to be in a specific format, or the employer couldn't even open the file, which meant that job seekers didn't know if it was received or could be opened. So there was very little flexibility to be creative with resumes. 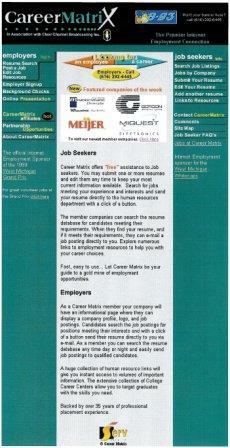 The CareerMatrix site worked well and grew as a great local job board for West Michigan. "Complex in its Simplicity." 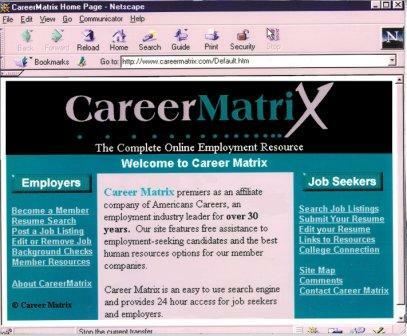 CareerMatrix first launched in June of 1998 which was shortly before Google launched its Beta version. 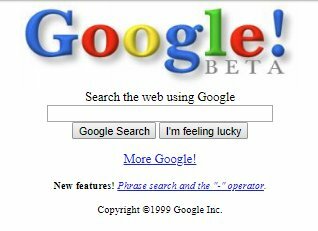 At the time, NetScape Navigator was the main browser available, and the dominant search engine available was AOL. Cell phones were around and PDAs had become very popular, but the two were just starting to merge into what we now know as smart phones. Amazon was around, but mostly sold books. There was no Facebook, YouTube, or Twitter, and people were just starting to prepare for the upcoming Y2K phenomena. Early on, CareerMatrix partnered with Clear Channel broadcasting, which helped the CareerMatrix name to become better known to the people of West Michigan. Our partnership also expanded into the annual Clear Channel/CareerMatrix Job fair, held at the Delta Plex in Grand Rapids. Dial-up modems were the most common on-ramp to access the Information Super Highway, and the first CareerMatrix launch was hosted with a local Internet Service Provider (ISP) called iServ, but the limitations of the system soon became obvious and before long we began our own in-house development of a new CareerMatrix.com. 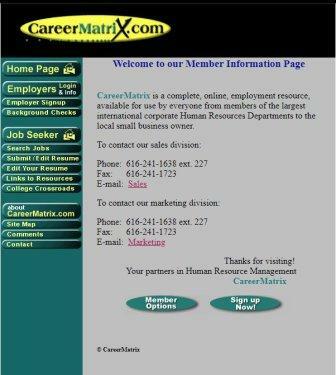 In the beginning, the only job posting package offered by CareerMatrix was a full year membership of unlimited job postings and resume searching. The cost back then was only $2,900 for the year. Within a short time, we launched our new in-house version and hosted CareerMatrix on our own servers. Among the many improvements to the site, we also began offering single job postings for 30 days at a rate of only $75 each. Four years went by very quickly and, when the owner was ready to retire in 2002, long time staff members, Dennis Hoyle and Tim Colthorp, formed a new company called NetOptions LLC, and purchased CareerMatrix to continue the growth and development of the site. The Matrix part of CareerMatrix has always been to blast out the employer's jobs to a number of other resources, which has always helped to attract more, and better, qualified candidates. In the beginning, we worked closely with college career centers to submit jobs, and we also found many other resources such as electronic bulletin boards, RS Feeds, and job aggregate sites to help us to broadcast these jobs to many other resources. As time went on, we built upon the CareerMatrix foundation, adding a number of new features and components to make it easier to use for employers and job seekers alike. Many of those functions are still in use today. Today, CareerMatrix.com has transitioned to an all new version of CareerMatrix.com and is growing with new features all of the time. Our Pre-Screening feature is greatly improved, and now allows essay questions. Employers now have a link right in the statistics section to find the name of those who responded to their jobs. In development today is an all new passive job alert function. When completed, this new program will immediately deliver relevant job leads to users at the time that they are searching. These job leads will more closely match what the seeker is looking for, greatly improving search results. We are very excited to celebrate 20 years of Great Jobs with Great Companies, and to have you celebrate with us. Come and grow with us as we move into another decade of Great Jobs with Great Companies.